This apparently collaboratively produced work depicts a southern landscape in the style of painters in the Jiangsu area. The title ‘Surveying the mines’ was followed on the original painting by an inscription that reads:’painted at Nanjing by Wei Zixi’, and the Cadre School Creation Group is likely to have included further otherwise well-known artists. 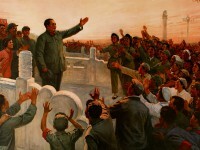 The subject was painted in response to state encouragement to go into the countryside and report on new mineral sources. The group here, equipped with rudimentary tools, are looking on the mountain for likely areas to investigate. 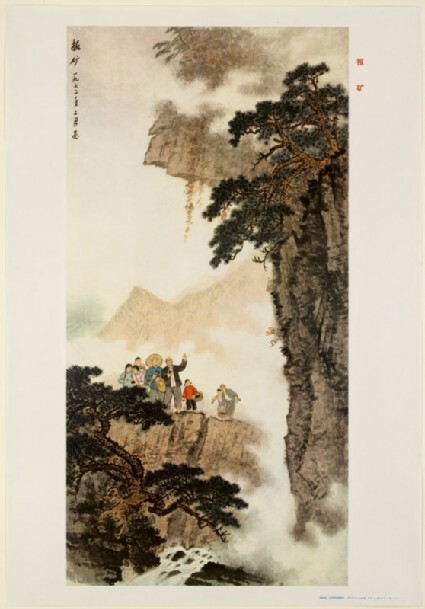 Though the group is somewhat larger and their clothes quite different, the scene nonetheless evokes a composition familiar from literati landscapes of the Ming and Qing dynasties (1368–1911) in which small numbers of scholars sit amidst mountain scenery, contemplating.